As an artist, James Little found inspiration in creating his own abstract impressionism paintings. Now he seeks to bring light to others in the movement as a curator with an exhibition entitled, "New York - Centric," now open through May 1. "I picked these artists because of the way they bridged the second generation of abstract expressionism." says Little of his contemporaries Ronnie Landfield, Dan Christensen, Margaret Neill and Robert Swain, among others, whose art appears alongside his in the gallery. "Despite other movements, they stuck with 20th-century modernism and painting... and I looked for artists who developed some sort of relationship with those ideas and the medium of paint." The pieces span the latter half of the 20th century and offer a vision of art in the onset of the 21st century, giving the viewer a sense of history as they walk through the multi-room exhibit. The striking thing is the space's versatility, with each piece complementing another as though brother and sister. The family resemblance is clear. 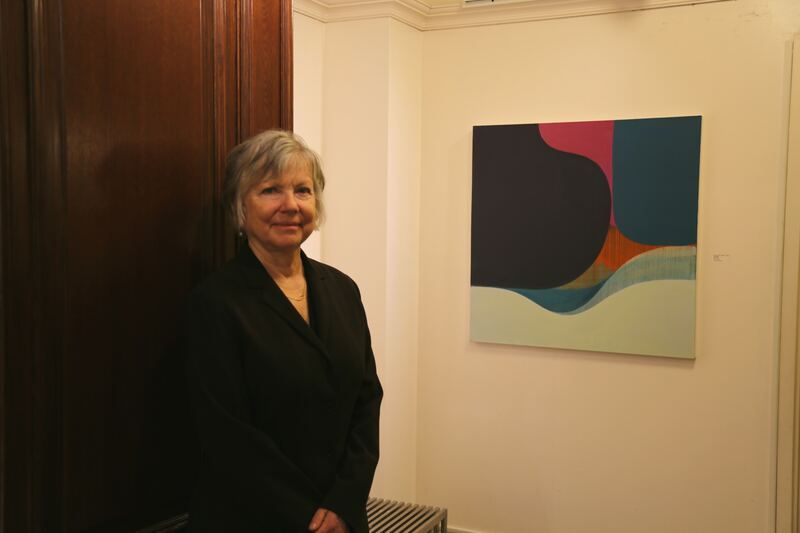 Margaret Neill poses beside her painting, PILOT, at the "New York - Centric exhibit" at The American Fine Arts Society Gallery. "With these paintings, you can feel the spirit of each artist and each brushstroke." adds Little. "They stand out because each artist takes a different advantage of the freedom of expression and the democratic approach to painting. Some of these artists are familiar and others are unsung heroes, but in my opinion, we are definitely working with the very best painters."